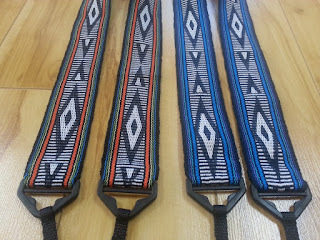 Last weekend I completed this commission of two inkle camera straps.The diamond pattern was created using the horizontal bar pick up. 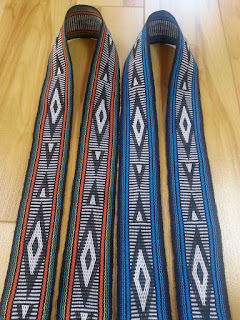 Straps are woven tightly with 100% cotton thread and finished using some really sweet hardware kits I ordered from ASpinnerWeaver! I also added some quick release hardware to these kits because clips were requested. 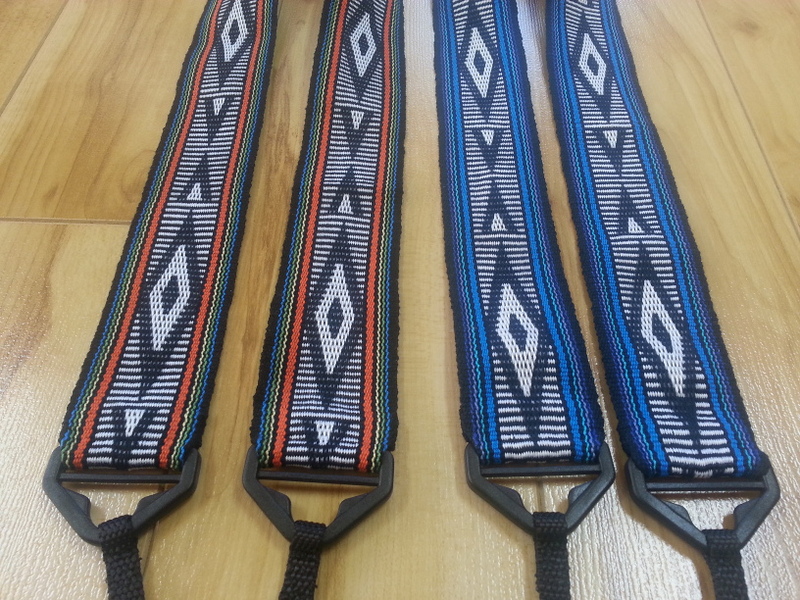 The finished straps measure nearly 2" wide and roughly 56" at maximum length (the webbing is adjustable). 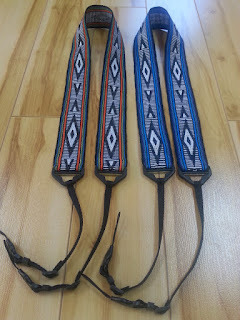 I really enjoyed weaving these bands and can't wait to get started on the next ones! So excite! All the work is amazing, the artists and artisans themselves, masterful. I encourage anyone who lives here, or is passing through to pop in and take a peek if you can. As with all art, it's best in the flesh. I welcome you to join us at the reception on January 3rd as well! There is also a slideshow of all the beautiful works HERE. 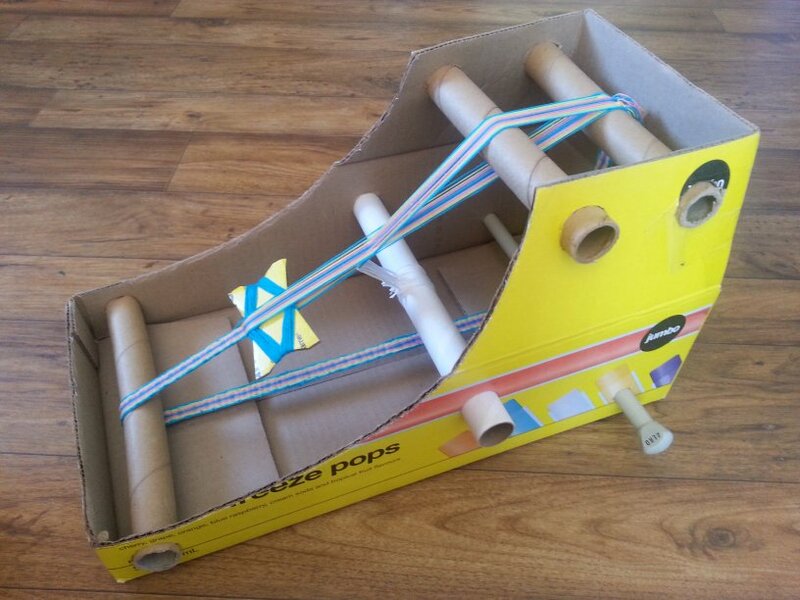 DIY Cardboard Box Inkle Loom Tutorial PART 3! Thank you for following along, and for staying energized excited about this project. I hope that you will join along with me and thread up that cardboard loom so we can take it for a little test drive! 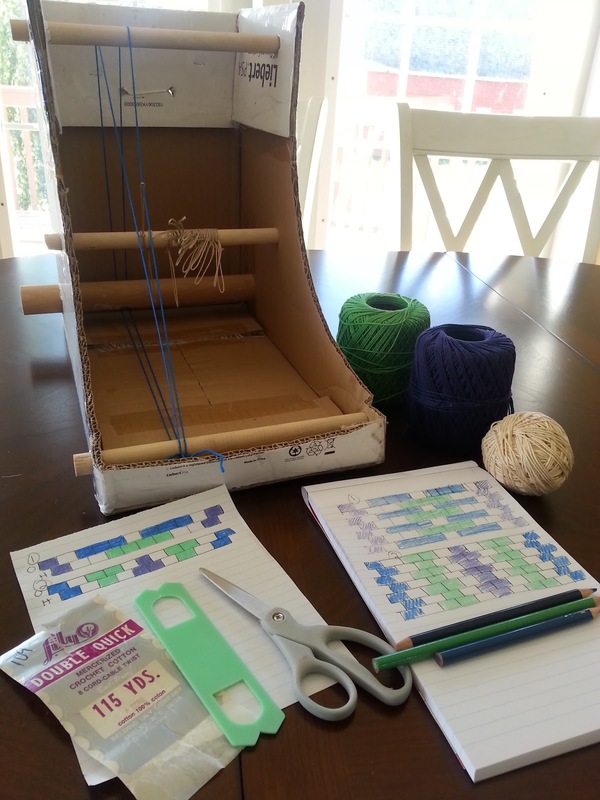 First you created an inkle loom out of a cardboard box (totally rad) and then you made some string heddles for it...now you are ready for part 3! Let's learn how to thread up that loom and start weaving an inkle! 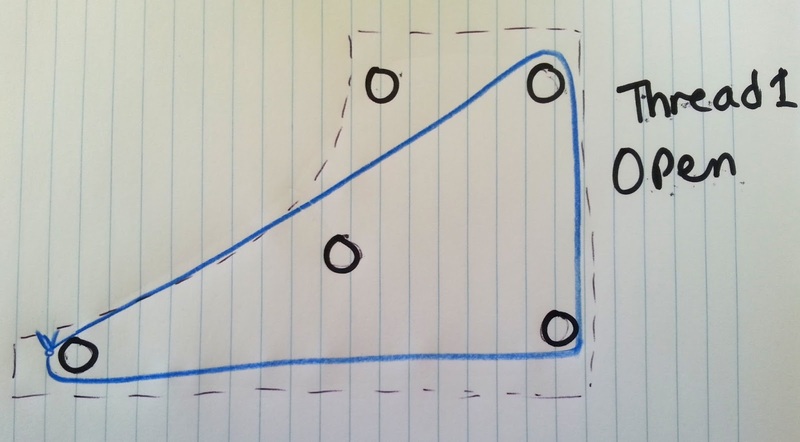 For this you'll need your loom, 20 heddles, a pair of sharp scissors, an extra piece of cardboard to make a shuttle, a plastic ruler you get inside a geometry kit, and 4 different colours of mercerized cotton string in a uniform size (thicker is better). 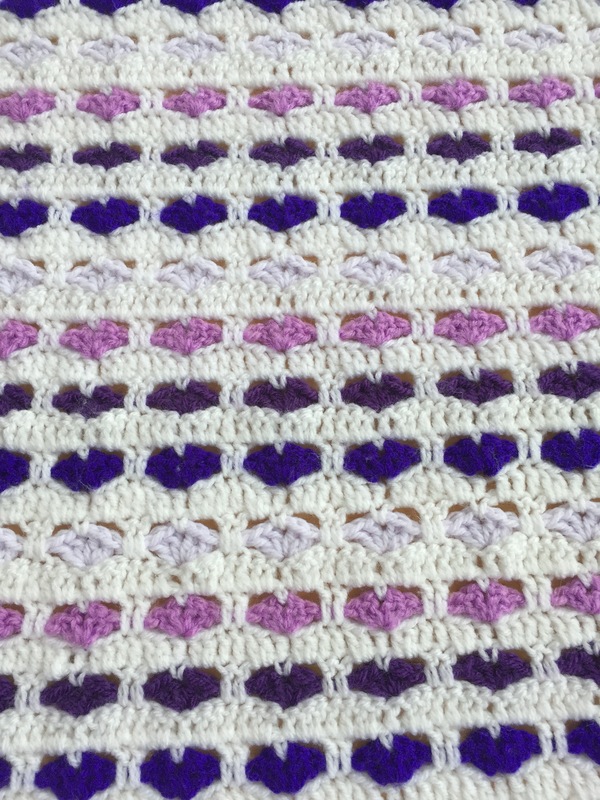 I used Lily brand 8 strand cable cotton yarn from the thrift store. Size 5 crochet thread would also work. 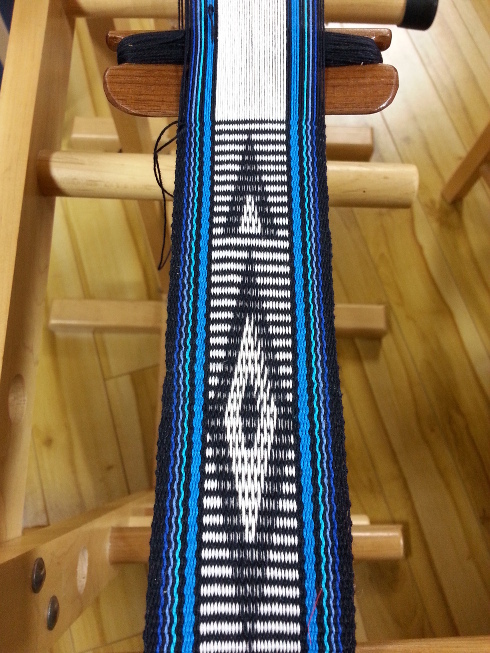 I DO NOT recommend you use wool, or acrylic or novelty yarns of any kind for your first few attempts. 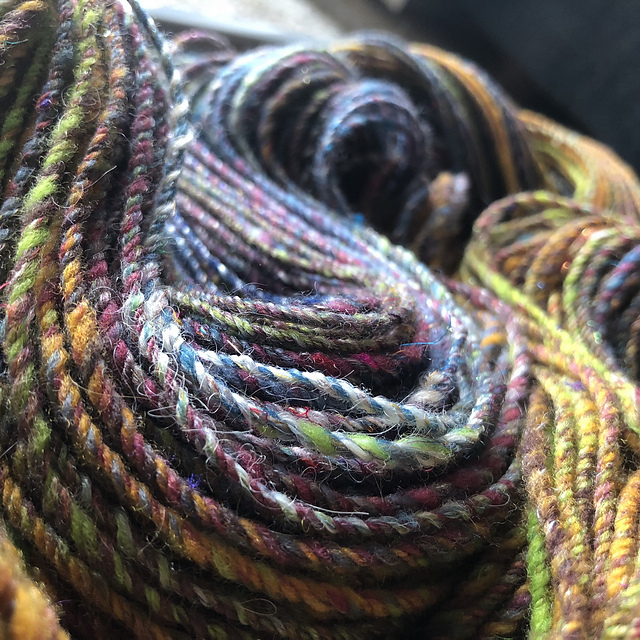 Acrylic yarn stretches, novelty yarn catches on everything and wool will usually bind and felt a little around the heddles. Smooth, tightly spun cotton is best. I also don't recommend using that thick baby cotton or the kind used to knit/crochet dishcloths, as that stuff is softer and loosely spun. It will pill and fray with friction. The tutorial is split up into six video segments. 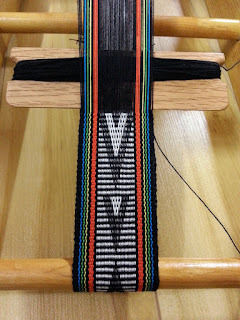 The first one is about warping the loom, and rest are a five part series about weaving your band, start to finish! I hope you find them helpful! My tools were limited, but I tried the best I could to give you a good start! Special credit goes to my loving and patient husband Justin Keller, who filmed all the segments and helped me figure out how to edit them. 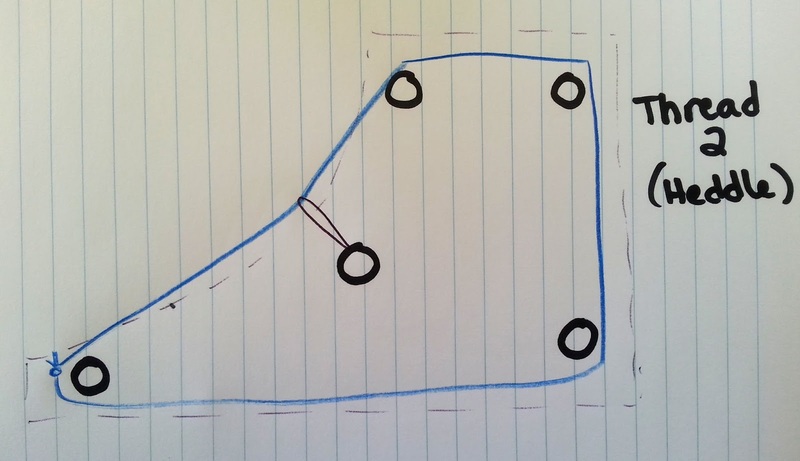 This is your pattern draft. It's done on brick layout graph paper. You can find all kinds of graph paper, including brick layout free online. 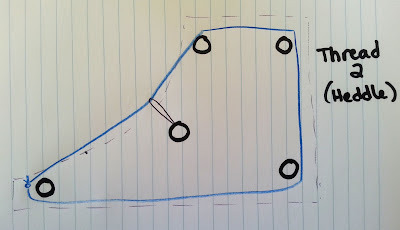 I get my graph paper here: http://incompetech.com/graphpaper/ . I like it because you can set the scale and everything. 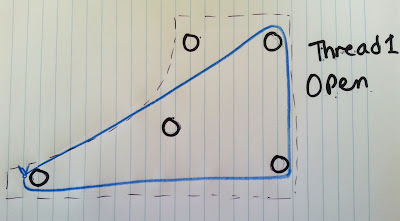 Some of the other graph papers found on that site are helpful for drafting more advance structures like basketweave pick up and horizontal bar pick-up. And this is how you read it, left to right, according to the numbers. I would keep the two sets of border threads the same colour. You can also sub colours in the white areas. The possibilities are endless--just with one pattern draft! 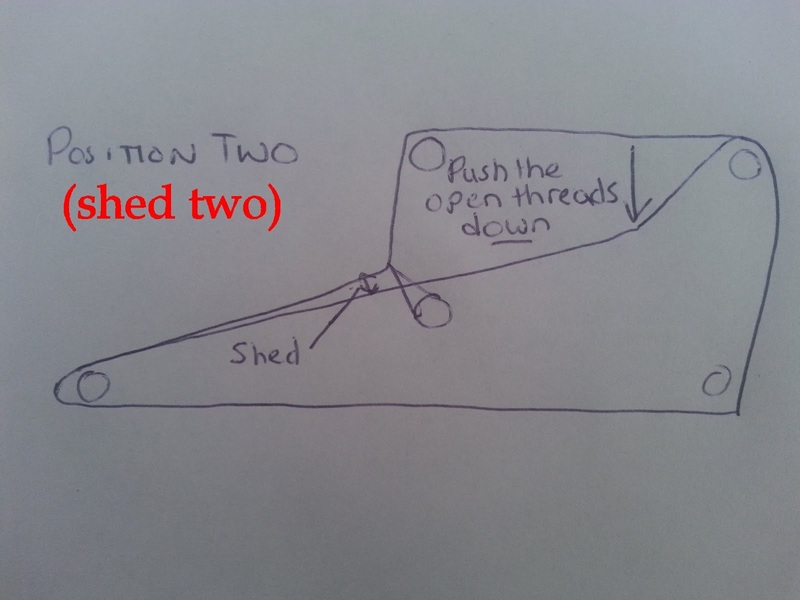 Position (shed) one. 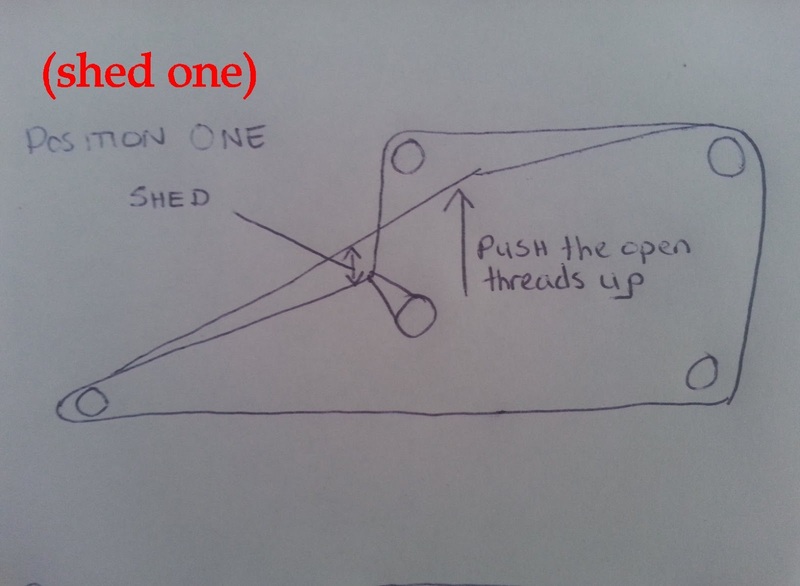 The open threads are above the heddled threads. 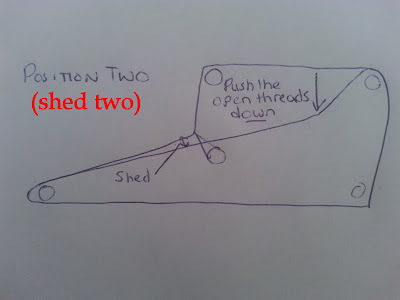 Position (shed) two. 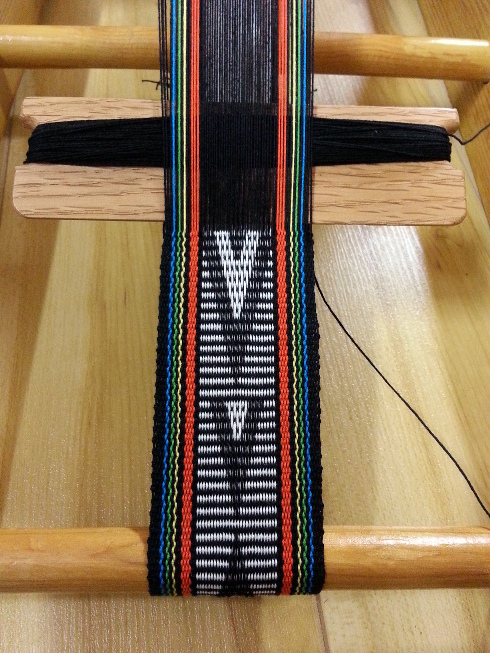 The open threads are below the heddled threads. 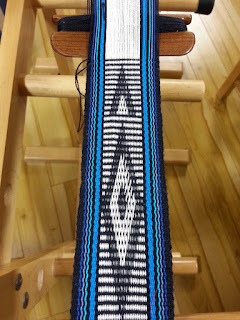 Best wishes on your inkle weaving journey!